An opened wing view of an American Lady. The American Lady (Vanessa virginiensis) is a medium sized species in the brushfoot family of butterflies. Ladies typically fly close to the ground with a fluttering motion and will land on the ground and spread their wings in and out. They are very common in Maryland and in different areas of the state, as I have captured photos of ladies at Eastern Neck Island, Blackwater, Elk Forest and Assateague, to name a few locations. They are easiet to distinguish from Painted Ladies when their wings are closed. 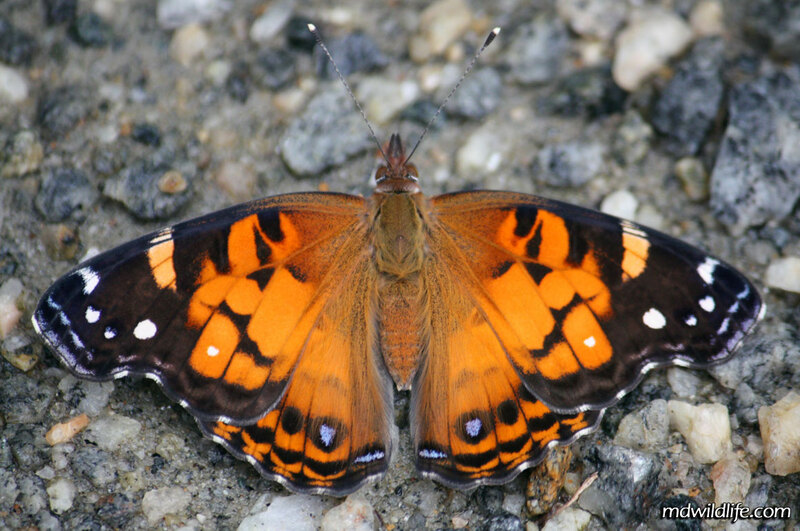 Americans have two large eyespots on the bottom of their hindwings, while Painted Ladies have multiple eyespots. The American Lady also has a white spot within the orange of its forewing. The Painted does not carry this physical trait. Ladies may still hang around in the fall months (October, November) but their colors may appear somewhate faded and dull.